A small flexible clothes lines lets laundry dry faster by allowing air to move around the clothing. I have placed a small s-clip on one end of my clothes line so I can clip it around an anchor. When inflated, these clothes hangers separate the front and back of the garment. This allows air to flow through and under the clothing – greatly speeding up drying time after laundry. The inflatable hangers also work as spares in a hotel room. I use a pack towel to wring out the excess liquid when I do sink laundry. The towel dries very quickly. It also makes me a popular house guest as I’m not generating a lot of excess laundry for my hosts. Hint: The more you wash the pack towel the softer and more absorbent it gets. Send it through a few loads of laundry before you take it on a trip. My light silk top adds several degrees of warmth to my outfits. It makes a huge difference on cold rainy days, or days when I am outside most of the time. I always have this item with me, even in the summer. It adds extra comfort in frigid hotel rooms. When I travel ultra-light I only take 3 pairs of underpants – one to wash, one to wear, and a spare. I have found the Ex-Officio brand is simply the best. They offer different styles from brief to thong. Yes, they are ugly – but very comfortable! You will want this battery charger if you have a point and shoot camera, a MiFi, or a cell phone with a rechargeable 3.7 volt battery. It is thumb sized, making it smaller and lighter than all the other chargers out there. The USB connector means that you can charge batteries using a computer, plug in USB charger, automobile USB charger, or a solar USB charger. If you own a smart phone or an iPad, you already own a USB charger. A dual port USB charger lets you charge two items at once. USB chargers are dual voltage, which means you only need an adapter plug to use them in another country. Be warned – second generation iPads and tablets require 2.1 A chargers. This means that a dual port charger will need to handle at least 3.1 A for two devices (one 2 A, one 1 A). There are few on the market that meet that specification. Check before you buy! These bottles are checkpoint friendly because it is very easy to see that they are empty. Once past security, fill them up at the nearest water fountain. They also collapse as they are used, making them smaller as the day wears on. The bottles stuff easily into a day bag. These bottles are rugged in spite of their appearance. I find that mine take about 3 years of hard use before they start leaking near the opening. If you look closely, you’ll see that I wrap my duct tape (gaffers tape) around the bottom of the bottle for storage. A light, unlined, waterproof, packable rain coat is a trip saver. You can’t modify the weather but you can mitigate the impact. Wear the coat alone when it rains or is windy. Add a sweater when the temperature starts to drop. Wear a puff jacket under it when the weather gets really cold. A good jacket packs small enough to fit into your purse or day pack. This is probably the most important piece of gear after your luggage and walking shoes. A packable ultralight puff jacket extends your wardrobe through autumn, winter, and early spring. Layer this item with your packable rain jacket and your base layer for winter trips. Down jackets are the least expensive. 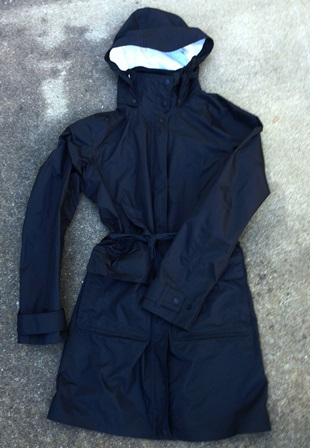 I prefer jackets filled with Prima Loft as they are water resistant and machine washable. This investment piece is worth every penny. A small “keychain” packable tote bag handles your side trips. Use it as a seat side bag when you want to store your carry on bag in the overhead bin. Use it as a beach bag, a bus bag, a grocery bag. You can even use it to store your gear when you are using your main bag for day trips. Mine is a Sea to Summit Ultra-Sil Sling Bag. It weighs a mere 2.2 oz and zips closed.